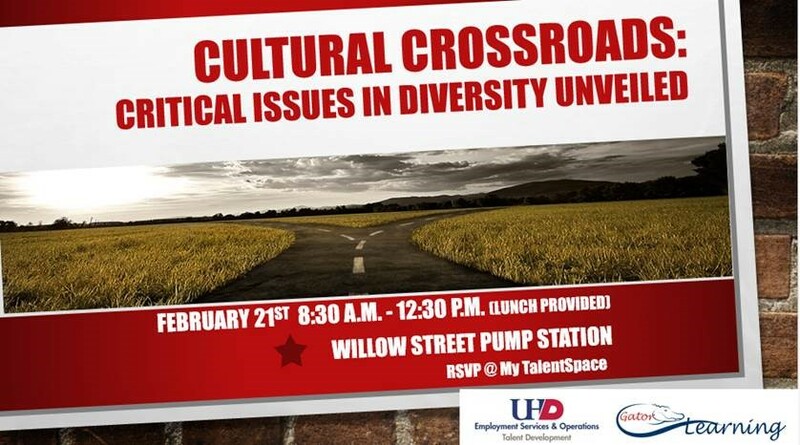 UHD Employment Services and Operations is hosting "The Cultural Crossroads: Critical Issues in Diversity Unveiled," a highly interactive workshop, from 8:30 a.m. to 12: 30 p.m., Tuesday, Feb. 21 at the Willow Street Pump Station. The event will focus on incorporating hands-on techniques that allow participants to build awareness of their similarities and differences; address internalized societal messages in a safe space; express their need of understanding based on their identities, and listen to each other's stories about the pain caused by stereotyping and discrimination. The workshop is offered by members of the National Coalition Building Institute, an international non-profit leadership development network dedicated to the elimination of racism and other forms of oppression. For more information, contact Kasha Gordon, coordinator, Talent Development Employment Services and Operations at 713-222-5332.